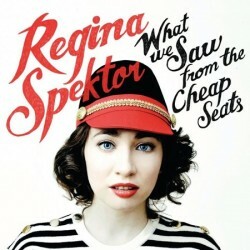 What We Saw from the Cheap Seats is the sixth studio album by Russian–American singer-songwriter Regina Spektor. The album comes after a three year musical drought following the 2009 release of her album ‘Far’. ‘What We Saw From The Cheap Seats’ is a bizarre roller-coaster ride that takes us through almost every facet of Spektor’s musical repertoire. This album contains everything from corrupt politicians, stereotypical Italian accents, a beat boxing drum solo that would rival the Eastenders intro and even a call for maturity at the end of it all. We are introduced to the album in the form of ‘Small Town Moon’ a piano-jazz number that takes us back to Spektor’s older days. The track is stripped back and more ‘normal’ than fans have come to expect. But any fears that Spektor has lost her quirky edge are immediately abolished with the albums second track. ‘Oh Marcello’ is a clear stand out track on the album. It contains two main elements, the first of which being the ‘dodgy’ Italian accent i alluded to above and the second takes the form a more ‘interpretative’ version of the classic ‘Please Don’t Let Me Be Misunderstood’. Other stand out track’s include recently released singles ‘All The Rowboats’ and ‘Don’t Leave Me (Ne me quitte pas)’ which actually featured on her 2002 album ‘Songs’. ‘All The Rowboats’ in my opinion, is a sort of pop invasion track. Its catchy beat is overpowering and backed up by Spektor’s trusty piano. It is a best of both worlds track, poppy enough to be current and still peculiar enough to fit the alternative bracket. Her unique songwriting style also features with some interesting lyrics, especially with her comparison of museums and galleries to ‘public mausoleums’. So it’s fair to say that Regina Spektor is the whimsical yardstick by which all quirkiness is measured by. But its not all whimsical idiosyncrasies. On my first listen I almost wrote off the album for being ‘gimmicky’, that is until I stumbled across ‘Firewood’. It is just simply vocals and piano, nothing else. It was a true showcase of her talent. Rather than hiding behind a wall of musical uniqueness she was vocally exposed and vulnerable. And prehaps we will be seeing more of this in the future? The album aptly ends with ‘Jessica’ a sort of call for personal growth and maturity. ‘We must get older now, So please wake up.’ Is this a sign that Spektor’s music is about to take on a deeper level? If its anything like ‘Firewood’ then I can’t complain. But lets just hope that she doesn’t lose her uniqueness in the process. Her voice reminds me of the girl in ‘Once’. Not bad. I love Regina, but this album was a bit “too” Regina for me. As a whole, like the album, but a few songs just were too much. I came across Regina with the 2006 album “begin to hope”. Much as I like her voice, I find I have to take her on a song by song basis. Sometimes she is oustanding for me, at other times I just can’t connect with her material. I have this album and always enjoy Regina’s work (saw her live once, she was awesome! ), but her songwriting here doesn’t seem as considered as her earlier works. I have only stumbled onto her music in more recent times. But I have heard other people say the same thing as you about her lyrics and songwriting.